Best True Dual Exhausts for Harley Reviews: Top-5 in April 2019! When replacing an exhaust system you are faced with a number of decisions; these include whether you buy a complete kit or a slip on muffler, and then you need to decide whether to buy a true dual exhaust system or a single system that splits into two. The advantages of a true dual exhaust system are that it takes the dual exhaust system utilizes two separate exhaust manifolds (headers), 2 or more catalytic converters, 2 mufflers and 2 separate exhaust tail pipes. As such, you do get better performance, better looks, but it does cost you a bit more too. The only downside in a separate dual system is that the gases leaving the manifold can de0syncronnize with each other, as such you might get more torque and power from one cylinder over the other. To combat this, a crossover pipe is added that allows the exhaust to mix with each other and maintains an equal pressure and performance from both manifolds. A true dual exhaust system will definitely increase your engine’s performance and as such increase power and torque. 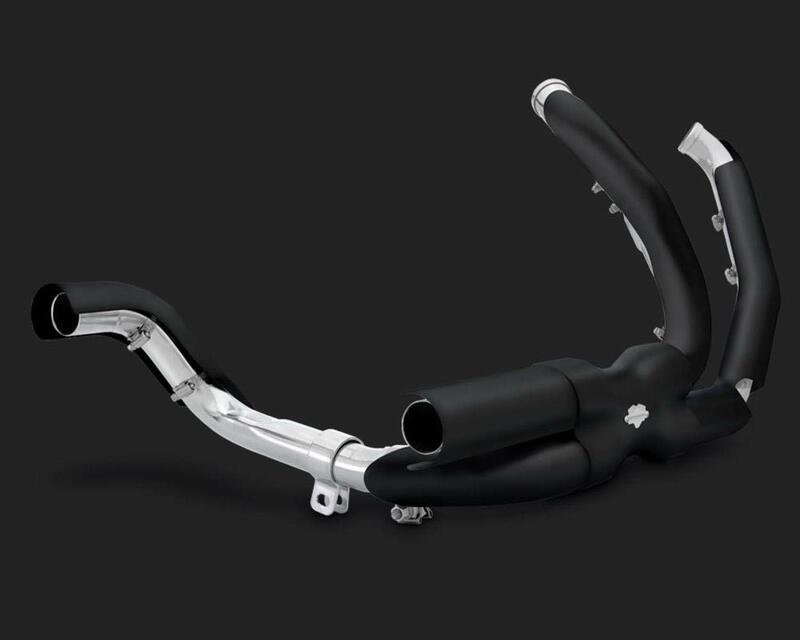 When adding a true dual exhaust, you are introducing a performance upgrade which changes the way your ride performs. 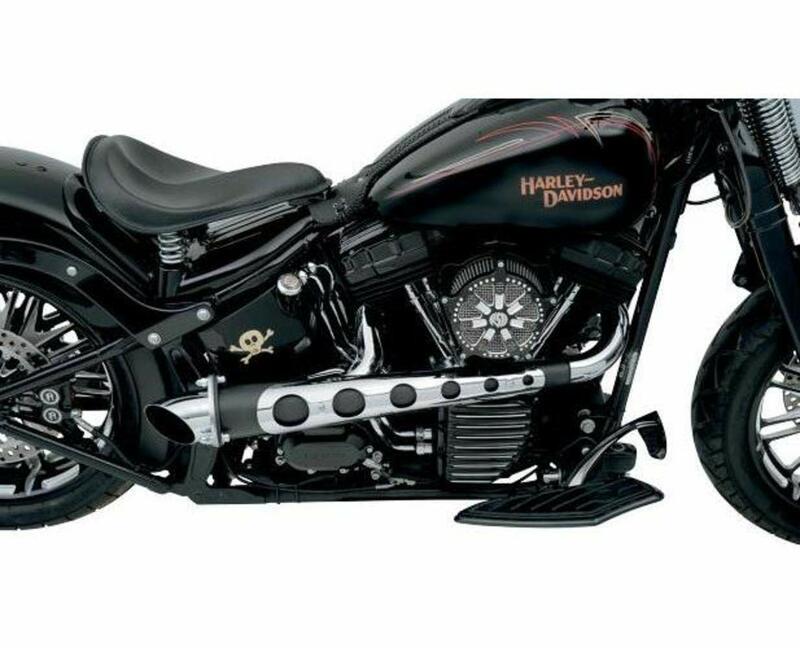 Now that you have decided to ramp up your bike and turn it into a power hog, let’s take a look at the best true dual exhaust for Harley Davidson on the market today. When it comes to power duals, Vance and Hines deliver every time with their factory perfect production methods. This is their black 46832 model that comes with contoured heat shields and has a performance power chamber crossover that assures dual effectivity, maintaining engine performance and integrity. The heat shield sheath covers the internal tubing, so you get dual performance from protection against heat and no discoloration. The heat shield Helps Reduce Exhaust Temperatures Up to 250° F, and they are full coverage. This model includes the Dual Bung Oxygen Sensor Ports of 18mm and 12mm. 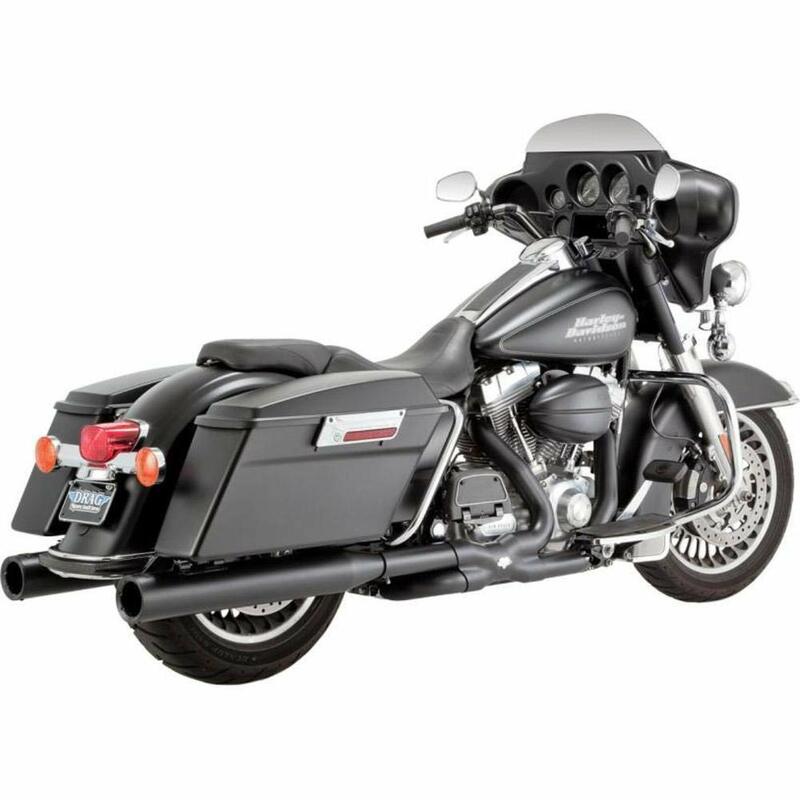 Any touring will look and feel better with a Vance and Hines true dual exhaust system. This one is their black mat option, and it looks absolutely magnificent while delivering even better performance results. These are true dual head pipes for integration onto a dual exhaust system. 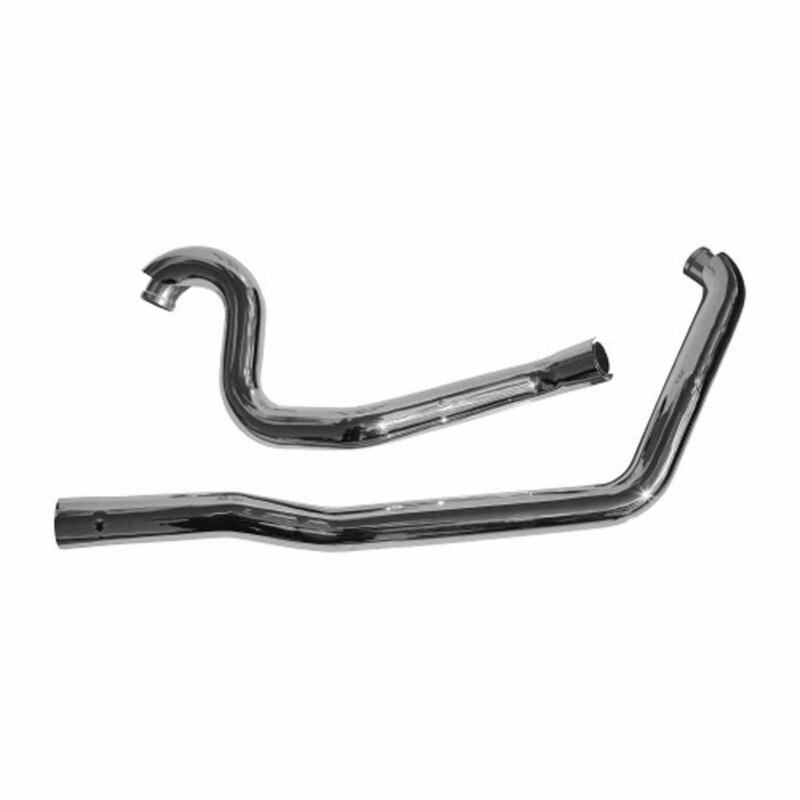 These chrome add-on pipes are made using 16-gauge steel layered with a ceramic coating in the inside and outside. After which a further chrome plat coat is applied for both design and structural integrity. This kit comes with full coverage heat shields that cover the 1 ¾” diameter pipes completely, and installation is fast and easy with all the hardware included. This is a comprehensive dual exhaust piping system that is made from prime materials and comes from the popular Rush Racing house. In every pack, there is a leader, and this one Rinehart Racing® full system exhausts model number 100-0200 is the leader for all 2009-2016 Touring models. It really doesn’t get better than this, and apart from the design which is subjective, the objective technological lead that this true dual exhaust system integrates is obvious after strapping them on and letting the engine fly. This system comes with the 12mm and 18mm O2 ports that integrate seamlessly with your OEM O2 sensors. As such, you get easy tuning when connecting to a programmer or tuner to upgrade the performance of these pipes. These classic looking pipes deliver the unmistakable Rinehart sound which combines with the exceptional performance upgrade in power and torque that surpasses all other models. Rinehart Racing Xtreme True Duals are the best in any and all lists of the best. This is the final stop; it doesn’t go beyond this station. Get off here. These unbelievable performance upgrades are beyond reproach, and you need to try them to understand why they are the best of the best. When it comes to custom built bikes, anyone in the world of bikes knows the name Jerry Covington, and if you don’t know this name you don’t ride bikes, you might think you do, but you don’t. Jerry Covington is a hall of fame custom bike designer with decades of experience and phenomenal artistic successes that have wowed the world and continue to do so. This is his Bassani Black Covington Hot Rod 2 into 1 Exhaust System that looks and feels totally different anything you have tried before. The performance upgrade is immediately noticeable, and since these are handmade bespoke designs, their performance upgrade goes beyond factory or mass assembly line performance. Now I always state that beauty is in the eyes of the beholder, so I won’t go to the beauty factor, its there, whether you like it, love it or hate it, is up to you. This is a megaphone stylized exhaust system, with a 2 into 1 design. It comes with a megaphone collector with turn-out end and removable baffle includes the Covington style holed full coverage heat shield. This is art, this is science, and this is power in performance. If special is what you want, and unique is what you seek, the Covington is what you must get. When seeking out a performance upgrade, especially a bespoke one, you need to find a model that is so particular that it’s like a genetic part of the whole. This is where the Vance and Hines 46871 comes into play. This is a genetically improved exhaust system for 2017-2019 FLHX2 models only. 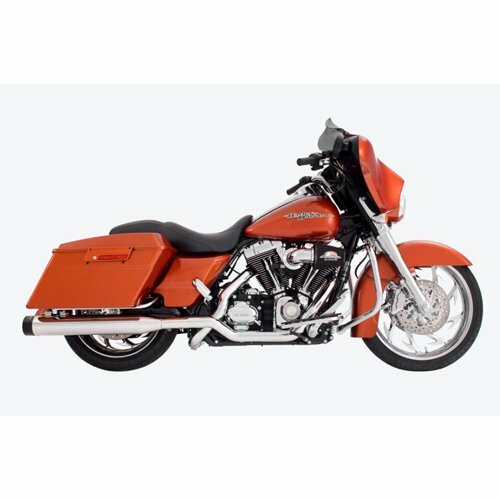 What you get here is a set of pipes that come with a complete contoured heat shield covering the entire load, including the power chamber crossover. This is a true dual exhaust system that when installed will blow off your socks as the G-forces rip through your toes. It’s Vance and Its Hines and what can I say, its perfect. This list was fun to build, only because I got to try out over 50 different models of the exhaust on a select number of bikes. The bottom line is that these five are the best for their applications. Now I know that looks are subjective, but you cannot argue with performance. Price is also subjective since rich people have no issues while us more economical challenged citizens need to consider every cent we invest in our rides. As such, there are hefty prices in this list; I could not honestly create a list of cheapo items, it would be a lie and would not give you the goals in life to achieve. Five more for the bucket list. What Carburetors For 383 Stroker Are The Best?